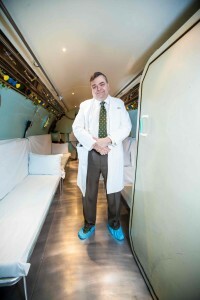 For more than 25 years, Thombs has directed care at the Hyperbaric Medicine Center at Presbyterian/St. Luke’s, helping patients with everything from diving disorders and carbon-monoxide poisoning to gangrene and non-healing wounds, which have become a growing concern in this country. While sitting for two hours day after day in a submarine-like vessel might not sound like fun, patients who undergo the oxygen-rich therapy more often than not see their wounds heal. “Wound healing is energy intensive,” Thombs says. “And the more severe and bigger the wound, the more of your body’s resources it takes.” Oxygen powers the cells for healing and boosts the bacteria-fighting immune response, reducing infection. Placing patients in a pressurized environment increases the amount of oxygen that infiltrates their systems up to 20 times that normally consumed at sea level and can decrease destructive inflammation, another barrier to wound healing. As obesity and diseases of aging, particularly diabetes, continue their upward climb in the United States, non-healing wounds are taxing the medical system, leading to increases in advanced clinics and hyperbaric chambers. 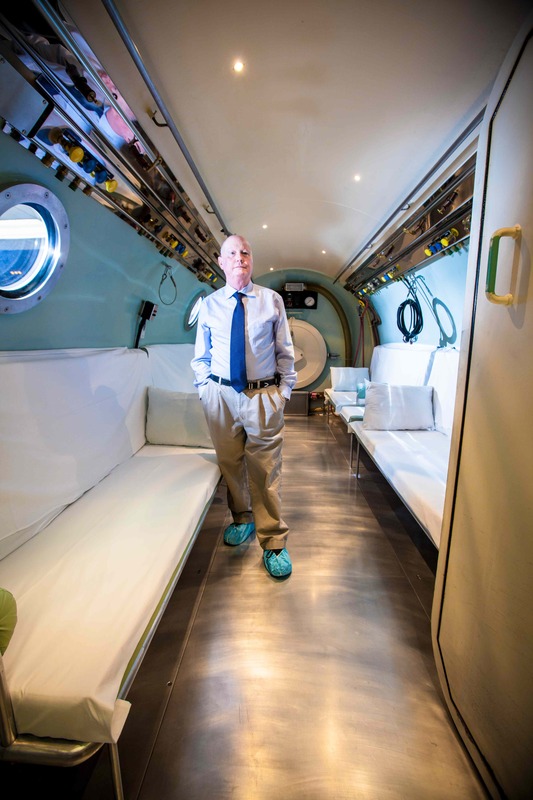 P/SL, which served the hyperbaric needs in the Rocky Mountain Region alone for more than two decades, now has company, with HealthONE alone adding two clinics with chambers in just the past year: one at Swedish Medical Center and one in the works at Sky Ridge Medical Center. “We have a small wound clinic in the hospital now, but it is one day a week, and we’ve realized that the necessities of the community for these services are greater,” says Adam George, hospital liaison at Sky Ridge. The center’s new Advanced Wound Care Clinic will house two mono-place (one-patient) hyperbaric chambers to help treat outpatient wound patients, and the Swedish clinic has four single-patient chambers. P/SL’s multi-place chambers can hold 10 patients and their medical attendants at one time, allowing the hospital to also serve emergency and inpatient needs. Still, the new chambers have plenty of patients to treat, says Dr. Steven Snively, medical director of the Burn and Wound Clinic at Swedish. “I’ve already had a couple of patients whose wounds I had been unable to heal who have gone on to healing with the chamber.” Many wounds respond to hyperbaric therapy, including surgical incisions, radiation-therapy burns, arterial-insufficiency ulcers and diabetic ulcers, Snively says. Grim statistics promise to keep these advanced clinics busy, with more than one-third of Americans obese and more than 25 million diabetic, a disease that accounts for more than 60 percent of the non-traumatic, lower-limb amputations each year, according to the American Diabetes Association. Another 79 million Americans have pre-diabetes, the ADA says. An average chamber treatment prescription includes two hours a day, five days a week, for four to six weeks, Thombs says. About 75 percent of non-healing wounds resolve when hyperbaric therapy is added to standard medical and surgical treatment. Medicare and most major insurance companies will cover treatment for severe diabetic foot and leg wounds, wounds following radiation therapy, and chronic bone infections, Thombs says. “That often means the bone has to be exposed, or you have to have a chronic bone infection that has failed medical management.” If he could help patients earlier, treatments could be shorter and success rates higher, he says.